This adorable handbag is a good-looking option for those who prefer imitation leather (I would not call it “patent”, it's not shiny at all). Actually, it looks like the real thing and the metal accents, manufacture, finishing and design are all excellent. I have been using it almost every day since I received it for evaluation and review five weeks ago, and it's standing up to frequent handling and abuse remarkably well. It is a useful size, not too bulky but large enough for my very big wallet (a clutch really), phone or tablet, keys, pen, lip gloss and compact. The fold-down flap, with an easy two-stud magnetic closure, lifts to reveal a front pocket, suitable for a portable phone or tablet, or a glasses case. A full zip seals the main body of the bag and inside are a smaller zipped compartment (large enough for a passport) and two open pockets shaped to hold a phone, glasses case or make-up compact. With a secure top handle and a long, adjustable and removable shoulder strap, you have the option of wearing it across the body, over the shoulder or carrying it by the handle. I selected the blue one, as I wear jeans and the colour blue a lot. 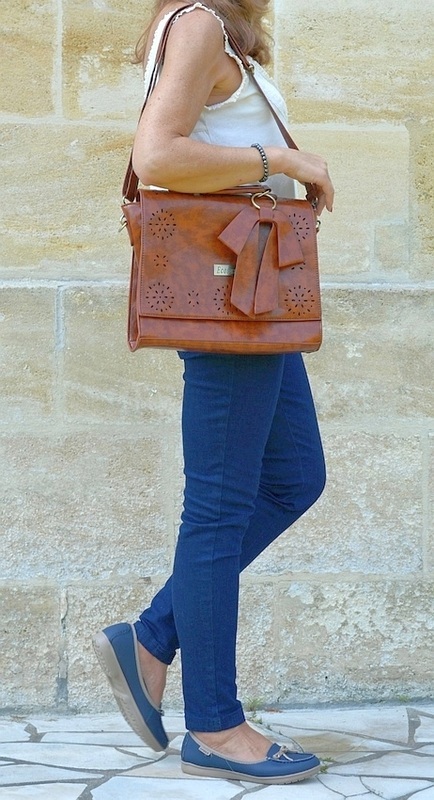 It's very easy to co-ordinate and looks great with everyday clothes, both casual and more dressy. I also really like the cut-out pattern on the front. 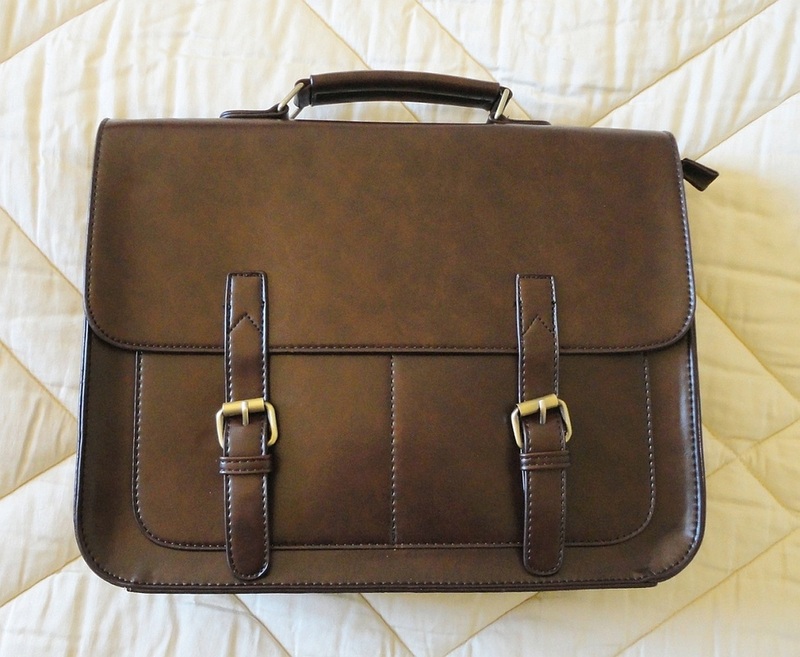 A roomy, well designed document carrier, with a distinctly masculine aesthetic. 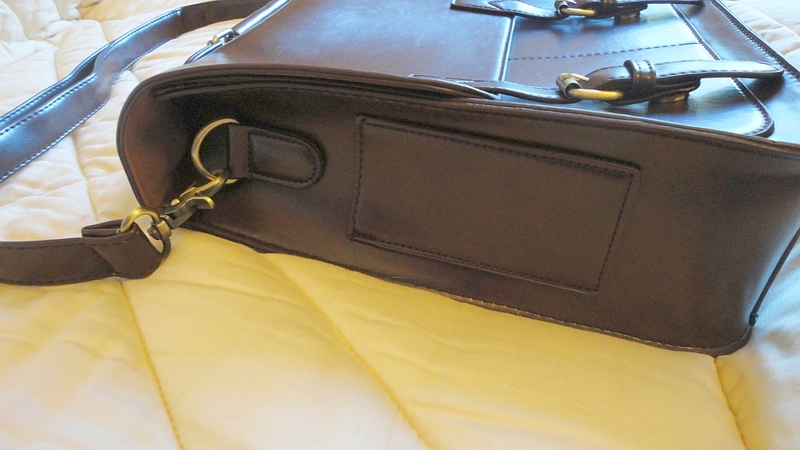 I received a complimentary bag for evaluation and review, and opted for the Coffee colour. 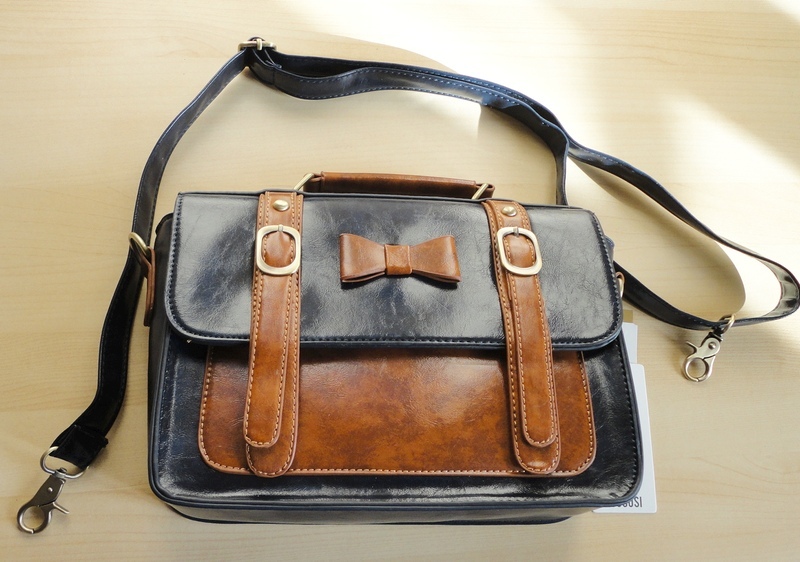 It is also available in Brown (an attractive tobacco shade) and classic black. I consider it an alternative briefcase because this can easily be used in place of a classic hand-held briefcase (and carried in the same way by the top handle) but it also offers the option of a long, adjustable shoulder strap. 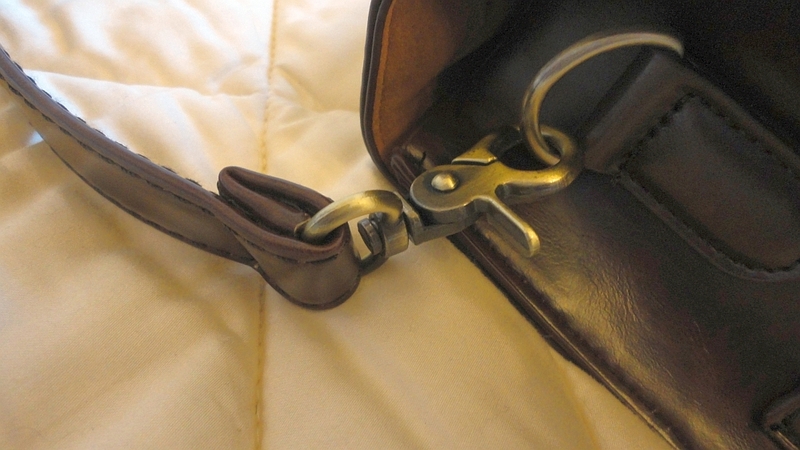 Instead of opening flat, there is a fold-over flap closed at the front by two magnetic studs. 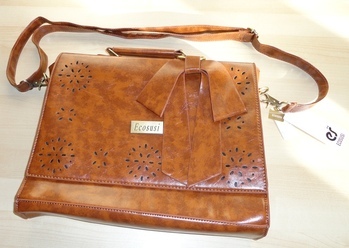 The main body of the bag can be sealed completely with a full-length zip or left open for easy access. 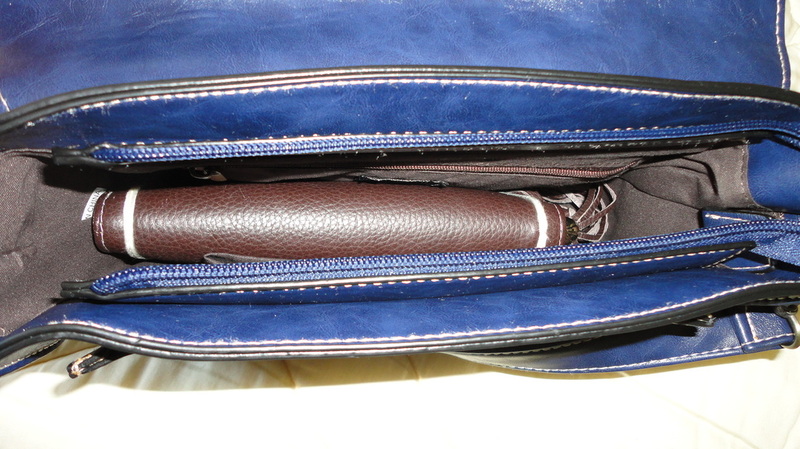 The interior is lined in a swede-like soft fabric and there is a small zipped pouch. On the outside there are two flat, open pockets of a shape and size suitable for a phone or tablet up to 8 inches or so. The two slim pockets on the sides are so flat that I can't really think what could go in there, perhaps pens or styluses? 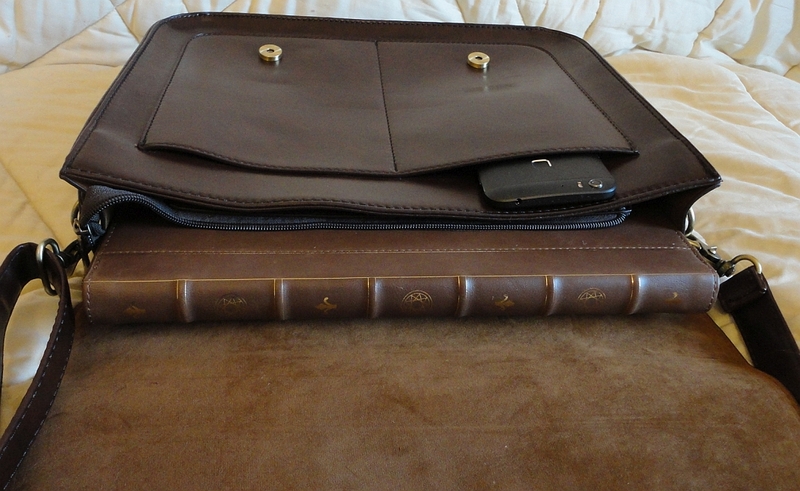 The interior is 3 ½ inches or 9 cm wide at the base, perfect for books, documents or even a laptop. So quite a lot of usable inner space. My husband uses this to carry his 13” laptop (you can see it inside its protective sleeve in my photos) as well as papers, sunglasses, wallet and other items. The material is a fairly stiff faux-leather, stained to roughly suggest the look of the real thing. 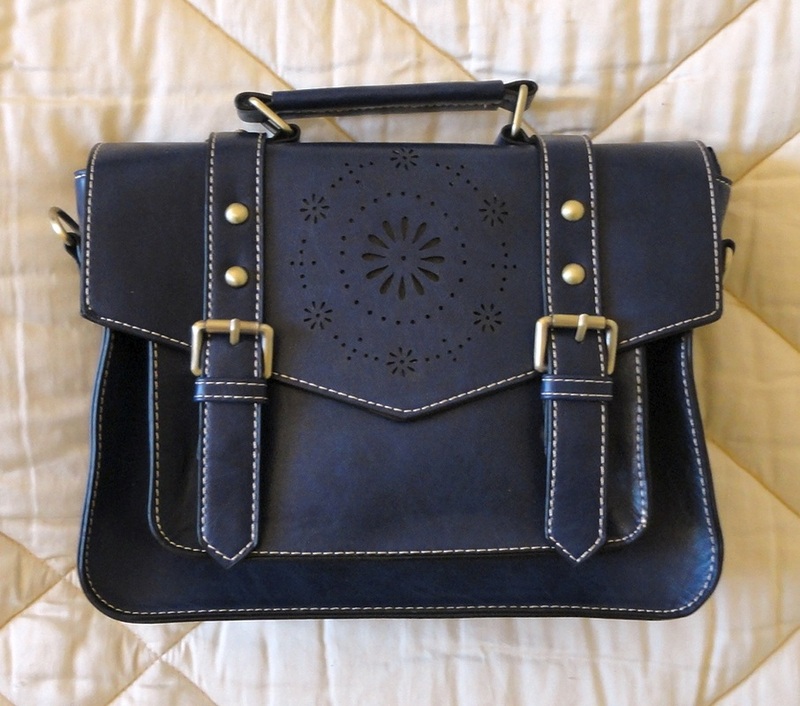 The bag is strongly made, and nicely finished with antiqued metal accents and regular stitching. If it's anything like the usual Ecosusi quality, it will prove durable and resistant to a fair bit of handling. My husband likes it and gets a lot of use out of it. 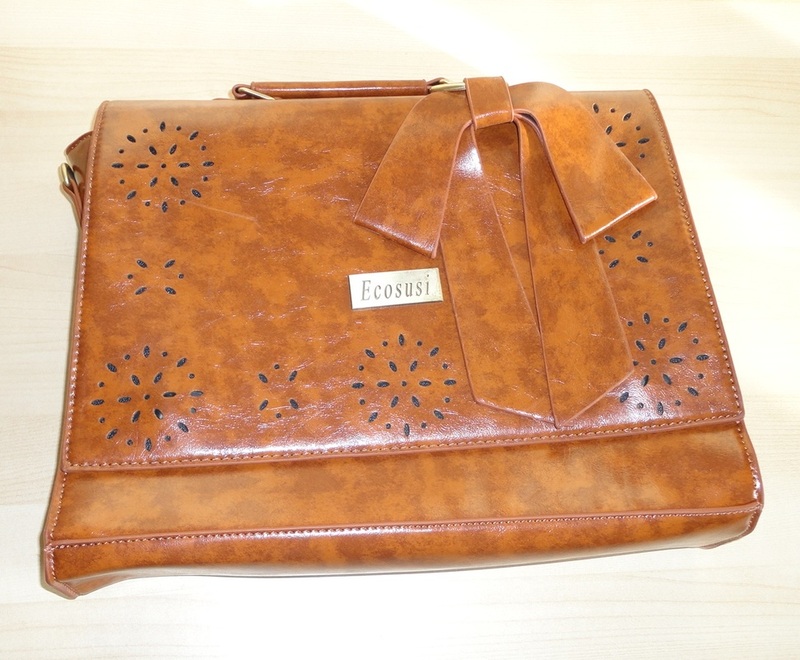 This well-made, roomy handbag features a discreet cut-out pattern, a metal tag, bearing the name of the maker, Ecosusi, and a very large and floppy “leather” bow, attached to the handle by a metal ring. The material is a very supple faux-leather, stained and creased to suggest the real thing but with an unpretentious, cheeky look. The perfect fashion accessory to use and abuse without worrying about it too much. The front flap closes by means of two magnetic studs. The main body can be sealed completely with a full-length zip or left open for easy access to the fabric-lined interior. There is a small zipped compartment, and two open pockets of a shape and size suitable for a phone, a glasses case or make-up compact. So, plenty of room for all the stuff that I consider essential to take with me. 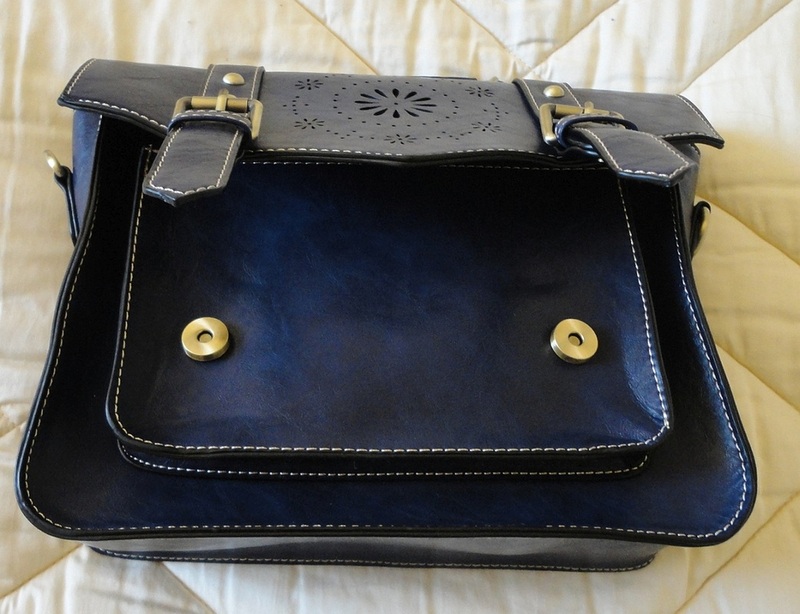 As well as a strong-looking top handle, there is a fairly long, matching and adjustable, removable shoulder strap. This style is currently available in two colourways: a warm tobacco shade, and black. I chose the tobacco one because I liked the way the black backing shows through the cut-out pattern. The black version is definitely dressier and looks elegant in an understated way. 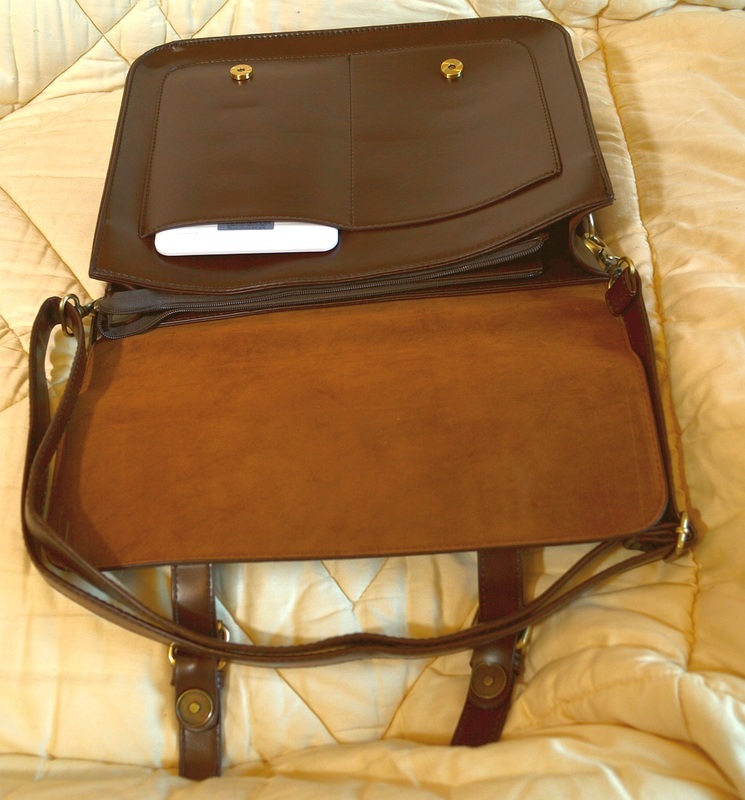 This bag is fairly large but not too bulky and it can just about handle A4 sized documents. The bag is well made, and nicely finished with quality-looking metal accents, and regular stitching, but only time and use will show its durability. I'm delighted with the sample sent to me for review, and can see myself using it a lot. Imitation leather is, to many people, a desirable and eco-friendly alternative to real animal skin and, presumably, the inspiration for the company's name, Ecosusi. 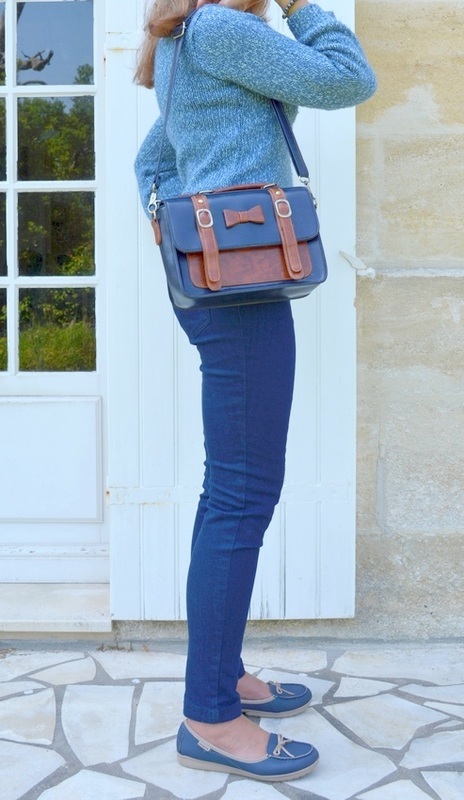 This bag has no pretensions to look like real leather, but it is an eye-catching and useful fashion accessory that doesn't take itself too seriously. 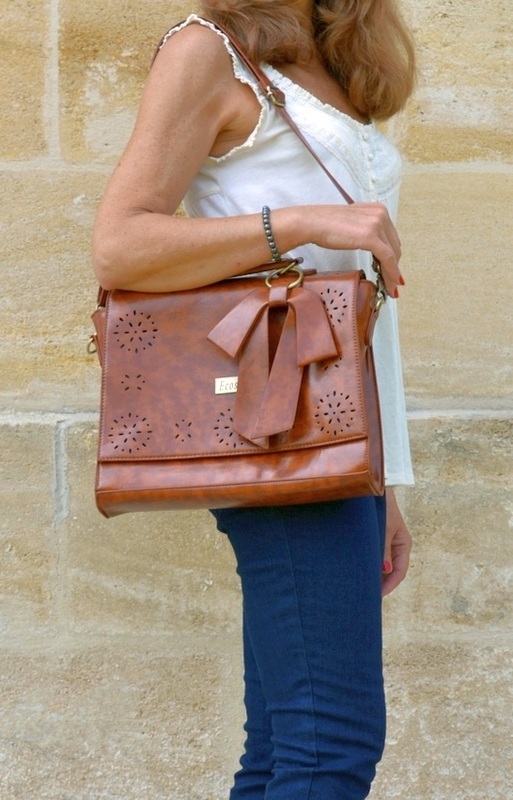 It does, however, perfectly fulfil the function of a handbag, with an easy two-stud magnetic closure, a secure top handle and a removable shoulder strap, in fact long enough to allow wearing across the body. 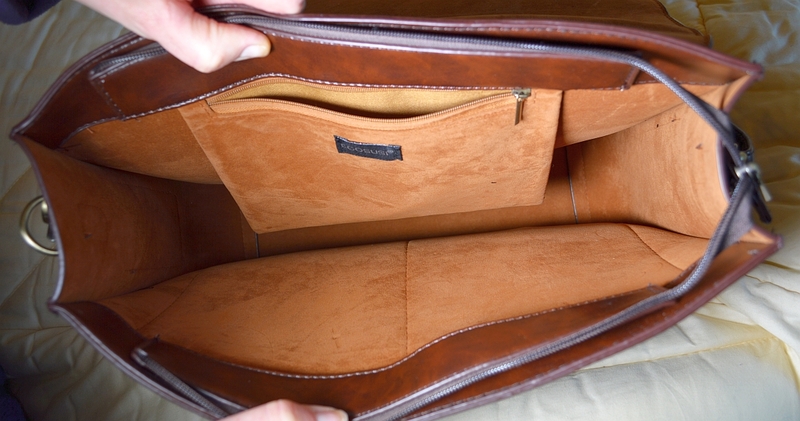 The fold-down flap lifts to give access to a front pocket, ideal for a portable phone or tablet. A full zip seals the main body of the bag and inside are a smaller zipped compartment (large enough for a passport) and two open pockets shaped to hold a phone, glasses case or make-up compact. So, plenty of space for all the bits and pieces I like to carry with me. 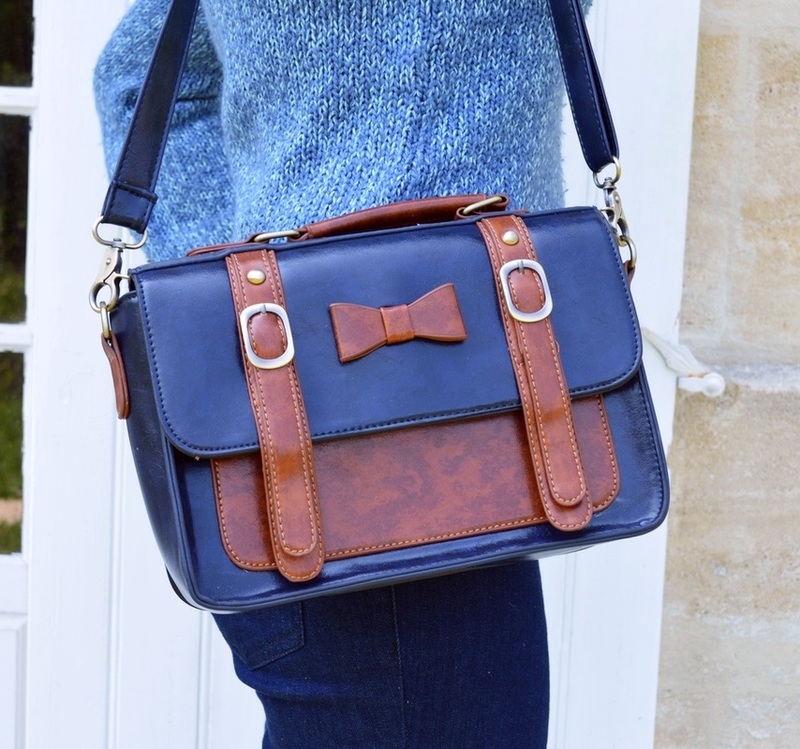 The style I was offered for review is really cute and quite distinctive with the body of the bag in a solid colour and the bow, straps and front pocket in a contrasting shade. There are currently two sizes and three colour choices: medium brown/dark brown, burgundy/light brown, and midnight blue/tobacco (the one I have). The two colours make a smart combination. I find it easy to pair with jeans or other casual gear but it goes equally well with more dressy clothes. This bag is an ideal size for me (I have the small version), deep and capacious enough for all the “essentials” but not so big that it feels like carrying an overnighter. The metal accents have a look of quality, the stitching and finishing appear even, sturdy and well executed, but only time and regular use will show its durability. A well-made and practical accessory with great visual appeal.